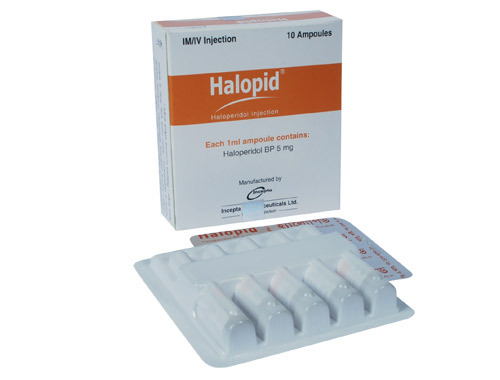 Halopid 5 tablet : Each tablet contains Haloperidol BP 5 mg.
Halopid Injection : Each 1ml ampoule contains Haloperidol BP 5 mg.
Haloperidol is a butyropherone derivative with antipsychotic properties that has been considered particularly effective in the management of hyperactivity, agitation and mania. Haloperidol is an effective neuroleptic and also possesses antiemetic properties. It may also exhibit hypothermic and anorexiant effects and potentiate the action of barbiturates, general anesthetics and other CNS depressant drugs. Haloperidol is a quick acting substance and has a duration of action of about 12 hours after one single administration. The optimum daily therapy consists of 2 administrations. Patients who remain severely disturbed or inadequately controlled may require dose adjustment. Daily dose upto 100 mg may be necessary in some cases to achieve optimal response. A suggested dose for the management of behaviour disorders in disturbed and schizophrenic children is 50 microgram per kg body weight. Haloperidol is a safe neuroleptic. Headache, vertigo, insomnia are the more common side effects encountered. Drowsiness, lethargy, stupor, confusion, restlessness, agitation, anxiety, euphoria and exacerbation of psychotic symptoms including hallucinations also may occur. Dry mouth, blurred vision, urinary retention, heartburn, nausea, vomiting, anorexia, diarrhea and hypersalivation have also been reported. Haloperidol may lower the convulsive threshold and has been reported to trigger seizures in previously controlled known epileptics. When instituting haloperidol therapy in these patients, adequate anticonvulsant medication should be maintained concomitantly. As with other antipsychotic agents, haloperidol should be administered cautiously to patients with severe impairment of liver or kidney function and to patients with known allergies or history of allergies to other neuroleptic drugs. Caution is also advised in patients with pheochromocytoma and conditions predisposing to epilepsy such as alcohol withdrawal and brain damage. Since the drug may have a possible potentiating effect on potent analgesics or hypnotics, caution is recommended when prescribing it to patients who are regularly treated with such drugs. For use in pregnancy and lactation has not been established; do not administer to women of childbearing potential or nursing mothers unless, in the opinion of the physician, the expected benefits of the drug outweigh the potential hazard to the fetus or child. 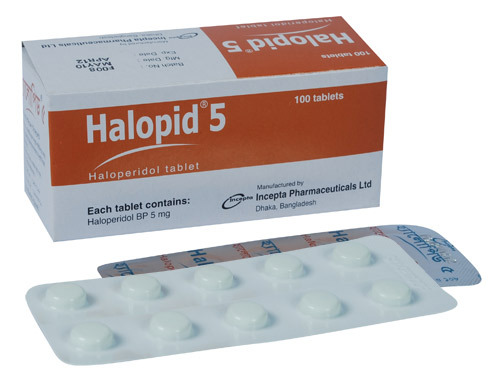 Haloperidol is excreted in breast milk.